Preheat oven to 350°F and spray ramekins with cooking spray. In a medium bowl, mix the peanut butter and powdered sugar with a hand mixer or by hand until completely combined. Form 8 golf ball sized balls and set aside. Scoop 3-4 tablespoons of cake batter into each ramekin. 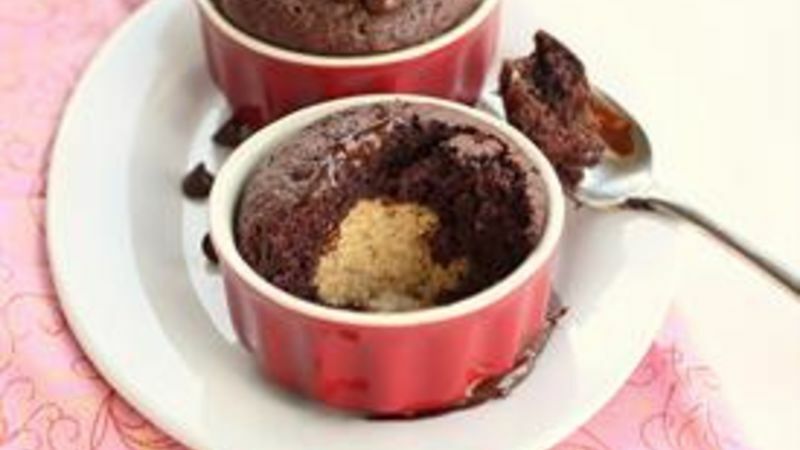 Place peanut butter ball in the center of the cake batter in each ramekin. Cover the peanut butter ball with 1-2 tablespoons of cake batter. Bake peanut butter cups for 16-19 minutes or until top is set and bounces back. Top each cake with 1 tablespoon of chocolate chips and let melt. You can spread them once they melt or just leave them as is. Peanut butter and chocolate were meant to be together -- cozied up in a warm, gooey cup of deliciousness. These Peanut Butter Cups are made from a devil’s food cake mix with a creamy peanut butter ball surprise in the middle. These come together dangerously fast. From first craving to completion, we’re talking thirty minutes tops. I decided to make them in small ramekins to establish some kind of portion control. Because believe me, you’re going to need some help in restraining yourself from eating it all. Start by preparing your cake mix as normal and pouring a little bit into the bottom of your ramekins. The real indulgence comes from these peanut butter balls. I made mine about the size of a golf ball and snuggled them in the cake batter. Top the peanut butter balls with a couple more tablespoons of batter so that the ball is hidden. Right when they come out of the oven top each cake with a tablespoon or so of chocolate chips and let them melt from the heat of the cake. Look at that chocolate melting on top. You can spread it with a knife after it has melted to make a smooth layer or just leave it how it is. The best part…the warm and creamy peanut butter inside. Dig in…you know you want to! What's your fave PB & C treat?